The photo above shows six frames of video showing the gauss rifle in action. Each frame shows 1/30th of a second. In the first frame, a steel ball starts rolling towards a magnet taped to a wooden ruler. In the second frame, a second ball can be seen speeding between the rightmost two magnets. By the third frame, the accelerator has sped up so much that the ball that is seen leaving the left side of the device is just a blur as it smashes into the target. One ball, starting at rest, has caused another ball to leave the device at a very high speed. The materials are simple. We need a wooden ruler that has a groove in the top in which a steel ball can roll easily. Any piece of wood or aluminum or brass with a groove will work. We chose the ruler because they are easy to find around the house or at school or at a local stationery store. We need four magnets. Most any type will do, but the stronger the magnets are, the faster the balls will go. Here we use the super strong gold-plated neodymium-iron-boron magnets we have made available in our catalog for the other projects. They work great. We will also need nine steel balls, with a diameter that is a close match to the height of the magnets. We use 5/8 inch diameter nickel plated steel balls from our catalog. 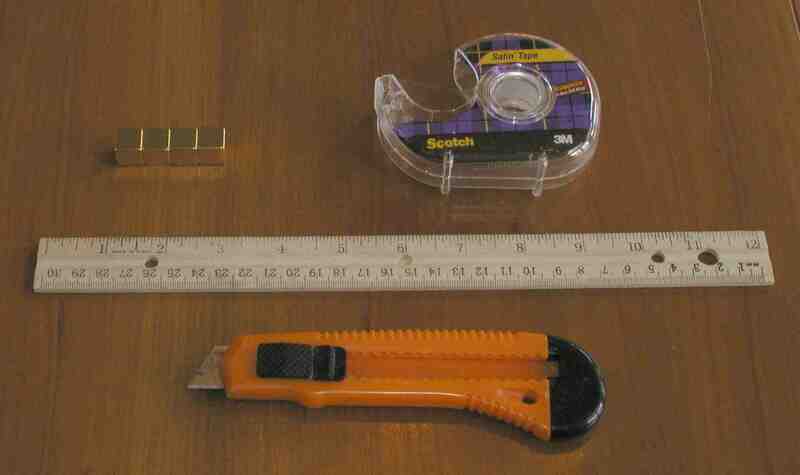 The only tool we will need is a sharp knife for trimming the tape. 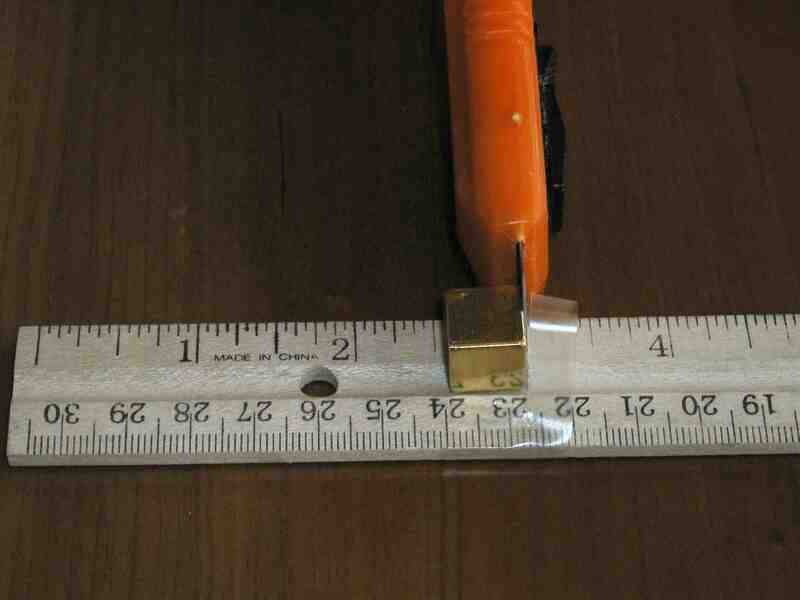 We start by taping the first magnet to the ruler at the 2.5 inch mark. The distance is somewhat arbitrary -- we wanted to get all four magnets on a one foot ruler. Feel free to experiment with the spacing later. With the sharp knife, trim off any excess tape. Be careful, since the knife will be strongly attracted to the magnet. The kinetic energy of the ball is transfered to the magnet, and then to the ball that is touching it on the right, and then to the ball that is touching that one. This transfer of kinetic energy is familiar to billiards players -- when the cue ball hits another ball, the cue ball stops and the other ball speeds off. The kinetic energy is now transfered to the last ball, which speeds off at 4 units, to hit the target. But each of these balls has another ball touching it. These second balls are not at the ground state. They are each 5/8ths of an inch from a magnet. They are easier to move than the balls that are touching the magnet. If we were to take a ball that was touching a magnet, and pull it away from the magnet until it was 5/8ths of an inch away, we would be adding energy to the ball. The ball would be pulling towards the magnet with some considerable force. We could get the energy back by letting the ball go. After the gauss rifle has fired, the situation is different. Now each of the balls is touching a magnet. There is one ball on each side of each magnet. Each ball is in its ground state, and has given up the energy that was stored by being 5/8ths of an inch from a magnet. That energy has gone into the last ball, which uses it to destroy the target. I have been getting a lot of mail asking what would happen if we made the track circular. Would we get free energy? Would the balls keep accelerating forever? I have been tempted to reply with the famous quote: "There are two kinds of people in the world -- those who understand the second law of thermodynamics, and those who don't". However, I am not the kind of person to leave an inquiring mind unsatisfied, and it is more productive (and kind) to explain in a little more depth what is going on. Suppose you made a circular track, and put two balls after each magnet. When the last ball is released, it encounters a magnet that has two balls at the ground state. There is no energy to be had from this magnet. The ball just bounces back. Now suppose you had placed three balls after each magnet. When the last ball is released, it hits a ball that is 5/8ths inch from the magnet. It has not gained much momentum, because most of the momentum gained is in the last half inch as the magnet pulls much stronger on things that are closer. But the ball has enough energy from previous accelerations to release the next ball. However, that ball has less energy than the ball that caused it to release. It may have enough energy to release another ball or two, but each ball that is released has less energy than before, and eventually the chain stops. You can show by inductive logic that no matter how many balls you stack in front of each magnet, eventually the system stops. To estimate the losses due to heating the balls as they compress when hit, consider a plastic tube standing upright on a table. Place one steel ball at the bottom of the tube. Now drop another ball into the tube, so it hits the ball at the bottom, and bounces back up. Now measure how high the ball bounced. If it bounces halfway back up, the losses are 50%. Perform the experiment for yourself with the balls from the Gauss Rifle. How high does your ball bounce? Send me mail with your results.